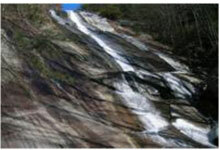 From an easy hike around Fish Dam Creek Trail at the W. Kerr Scott Dam and Reservoir to a strenuous climb straight up the Stone Mountain Loop Trail; Wilkes County is renowned for its hiking trails. With over 20,000 acres of public land and numerous wilderness areas, hikers have plenty to do and see all while exhaling and letting go in Wilkes County. A unique outdoor experience for the entire family. Located in the Blue Ridge Mountains, this scenic forest provides outdoor education centers, state of the art picnic facilities including a covered picnic shelter that can hold a maximum of 175 people as well as several talking and historical trails. If that weren't enough, all of this FREE. 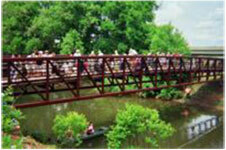 What a great way to explore and have fun in Wilkes County. Amphitheatre – seat 175 -200 people, electrical outlets, handicapped accessible W.
Named for NC governor and Senator William Kerr Scott, the Dam and Reservoirs was built in response to the catastrophic flood of 1940. The earthen dam was completed in 1961. The lake has 55 miles of shoreline with 1470 surface acres of water at normal pool level. The dam is designed to hold 50 feet of water in the event of a flood. The highest lake level was recorded in 1970 at 30 feet above normal. The lowest was recorded in 1978 at 10 feet below normal. 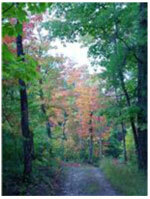 W. Kerr Scott boasts some of the best hiking and biking trails in the USA! There are currently over 30 miles of trail to enjoy at the lake. The herculean efforts of the Brushy Mountain Cyclists Club in designing, building and maintaining our trails have made Wilkesboro a premiere destination within the mountain bike community. Whether you crave the mountain bike excitement of Dark Mountain trail or a peaceful hike to the waterfall at Bushwhacker Falls trail, W. Kerr Scott trails have something for everyone. In addition to our trails we have wide open spaces like Dark Mountain Park where you can throw Frisbee or fly a kite. Your dogs are welcome but you must clean up after them and have them on a leash. Stone Mountain is not immediately visible upon entering the park that bears its name, but this magnificent 600-foot granite dome is well worth the wait. Sunlight and shadows dance across a broad tapestry of stone. White-tailed deer emerge from the security of the forest to graze on meadow grasses at the mountain's base. The scenery is only one attraction of the park. With more than 16 miles of trails, it will be a great day to take a hike in the park. Is a personal experience, trying something new or honing newfound skills. It's seeing with your own eyes, feeling, touching the unknown. It's a challenge to get out there and do something. This landscape of open meadows is a place to view wildlife and get a feel for the lives of those who lived here long ago. Doughton Park is one of the best places along the motor road to view white-tailed deer, raccoons, red and grey foxes, and bobcats, as well as spectacular shows of flame azalea and rhododendron in the late spring. There is a campground with ranger talks during the summer season. Hiking opportunities range from a short hike at Fodder Stack Trail to the strenuous 7.5 mile Bluff Mountain Trail. Visit the Brinegar Cabin to see craft demonstrations or hike into Basin Cove to view the Caudill Family Homestead. The Northwest Trading Post at Milepost 258 has a wide variety of craft items and souvenirs for sale from this part of North Carolina. surface acres of water at normal pool level. The dam is designed to hold 50 feet of water in the event of a flood. The highest lake level was recorded in 1970 at 30 feet above normal. The lowest was recorded in 1978 at 10 feet below normal. These facilities offer both tent camping and RV camping with water and electric hookups. 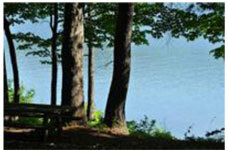 Each campground offers bath houses with hot showers, playgrounds, a swim beach, and access to hiking trails. Firewood is available for purchase each campground with proceeds going toward Friends of the Lake. 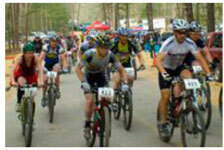 Whether you are road cycling or mountain biking, you've come to the right place. Bicycling is a wonderful way to see the outdoors, exhale while in the fresh air, or simply get around town. With miles of open highways for cross country riders and a full range of mountain trails for the energy driven, you'll want to strap a couple of racks, fill the backpacks and point your vehicle to the trails in Wilkes County.